So, I just have returned from California after spending the weekend working with my Dad, who drove up to help me out, in the backyard of my rental house in Fair Oaks. There were weeds that must have been 4 feet high. It was great fun. I get an email from the new people and it turns out that the ComCast cable guy fell, yes fell, through the ceiling when running cable in the attic. 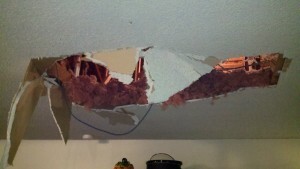 He was not hurt which is a good thing but the ceiling in the family room, not so much. I am glad to know that the tech was not hurt. I hope everything is fixed now. If you need further assistance, fell free to contact me. I work for Comcast.